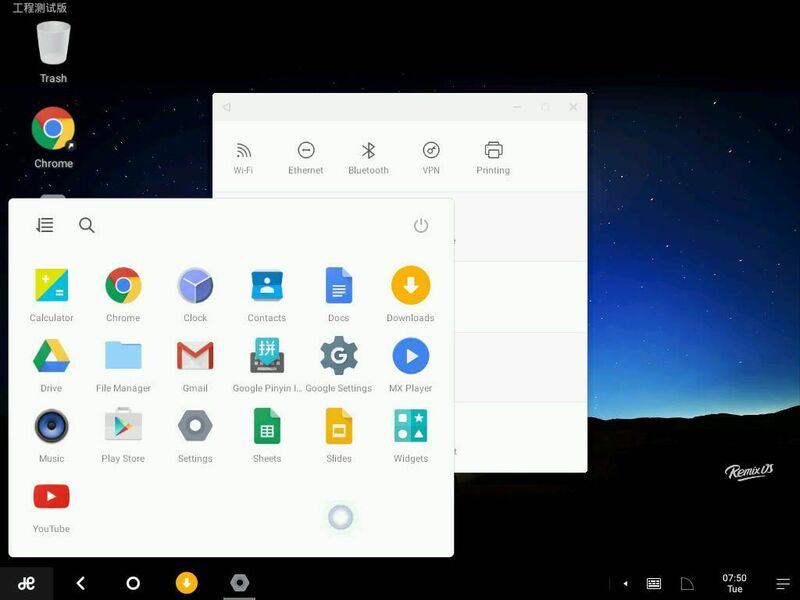 Remix OS is an operating system that aims to bring the Android experience to desktop environment adapting its PC standards. Based on the Android-x86 project, is able to run a full operating system from which to launch apps and take advantage of the characteristics of ecosystem of Google. Its interface provides a multitasking desktop with support for multiple overlapping windows, as well as a bar very similar tasks to which we can find in Windows 10 and a review of the notifications tab. It even lets you right mouse click on items to open context menus, in addition to associated default special access most of our physical keyboard. All this without neglecting all the features and elements of native Android own system configuration and integration with our Gmail account. The operating system can be installed from a USB drive also allows run as a LiveCD externally. It also can coexist on the same computer with other operating systems, enabling a selection menu during startup of the machine. Remix OS is an interesting alternative that goes a step further than mere simulations as Bluestacks, allowing improved performance in humble teams as well as offering an alternative start to use Android applications with superior performance in many respects to a mobile terminal. What do we need to install Remix OS 2.0 on your computer? Undoubtedly, one of the failures is that although Android smartphones is great (what we would say if not a blog like this: P), in tablets leaves much to be desired in terms of productivity. A tablet with Android can be somewhat ‘capada’ while this operating system created by Remix can exploit much more the performance of Android tablets. A USB 3.0 flash memory in FAT32 format with a minimum of 8GB and a write speed of 20MB / s.
A PC with USB boot option Legacy. If you want to try this new operating system that combines the best of a PC and Android, you can do so using from a virtual machine to installing it on a USB stick. Thus, you have a laptop and storage which can be accessible away from home. It is the first approach of Android on desktops , and today you can already use the operating system Google PC, or at least something that resembles it a lot thanks to proposals like android-x86 , or more derived yet, Bluestacks . In these cases we can not speak of a complete and consistent operating system but mere simulations / emulations. Remix OS is an open proposal goes a step further by offering a complete operating system and adapted for use in desktop machines that today is the same available for free. The project is developed by Jide Technology, a studio formed by former employees of Google who, based on the Android-x86 mentioned have adapted completely mobile experience to the PC enabling intensive mouse and offering a closer multitasking desktop what we are used rather than simply replicate the environment closer to the philosophy offered by Chrome OS.Although previously already leaked an Alpha, and can be obtained from the official source, pudiendolo run from an installable ISO image from a USB disk or keeping an eye before testing through virtualization. The installation process is somewhat tedious but nothing complicated. The first thing to do once downloaded the ISO is to install it on a USB drive via its own tool, called Remix OS USB Tool that in some cases will be detected as malicious by Windows Defender. To temporarily disable the antivirus before downloading have settled ballot. After this simply restart the computer in question by choosing the pendrive as boot option to begin the process of completely friendly installation compatible with operating systems that already have installed via a selector start. We create a new virtual machine, type put Linux as we marked versionLinux 2.6 / 3.x / 4.x (64-bit). Of RAM size we at least 2048 depending on the available memory on your machine and hard drive virtual create a VDI (VirtualBox Disk Image) with reserved dynamically size. Once the machine created we go to the Settings section of it and chose Pointing device PS / 2 mouse. In the Display section is maximal video memory (128MB) and mark the box 3D acceleration. Now we go to the Storage section and remove the hard drive that we had previously created. Within Controller: SATA create a new optical drive and associate with ISO RemixOS. Now we start the machine, you can choose to boot a rigid version of the operating system and another that allows you to save the changes you make to subsequent sessions. In either case we set the cursor to the option in question and press the TAB key to enter a small addition to the launch command. Specifically we write at the end of the expression “VGA = 791” without the quotes. Now, press the Enter key and the system will start.